I'm not an expert but I've found the smaller ones are usually harsh, not these, light vanilla taste, smooth smoke. These are my favorite for a quick smoke. Must be somebody else's since you can't keep them in stock. Small but when you only have time for a quick smoke it was good. Very smooth tasting stick. Easy to manage! Great little cigar and nice draw. This one has never let me down, great smoke, just wish they were longer. I love this product and order these along with my usual cigarillos because this size comes in handy for short smokes when needed. However, they are pricy but you have no choice really, Tatianna is the only manufacture to offer this size and a good taste. 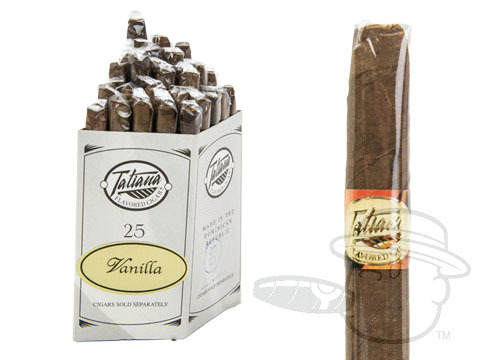 Tatiana Miniature Vanilla Bundle is rated 4.3 out of 5 based on 28 customer ratings.